This topic contains 16 replies, has 5 voices, and was last updated by MSPControl 3 months, 2 weeks ago. When I removed some “buggig” Custom Header (old config) from a web site, it then removed all of my https:443 bindings i did get from when I installed the CERT. So I had to put i back manual in the IIS config. Has this been fixed? We upgraded to 6287 yesterday and now when creating instant alias some of the existing bindings are being removed. Suspect that this causes error when creating new hosting space. And still missing basic https binding handling. Same issue here. Looks like when a SSL is issued the Require server name indication checkbox is not checked. Looking into this. Yes we’ve issued multiple fixes for this it broke during some other updates. It should be fixed soon. This has been fixed in MSPControl 2.0.0.137. Unfortenately the bug is still there. The “require server name indication” in not checked when a SSL is added. 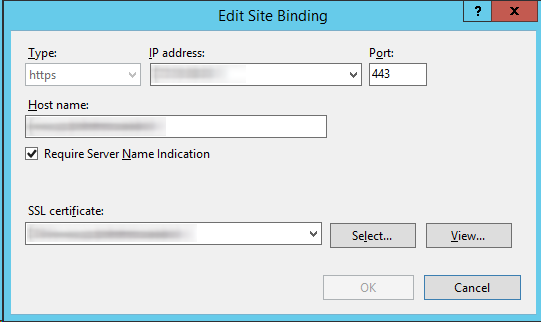 Did you set SNI checkbox in SSL Settings in IIS Provider settings in Panel? Yes I did, error still exists. 1.0 does not support SNI. please download 2.0 version. But it worked in 1.0.0.6330- ? Any other complications when upgrading to 2.0? 1.0.0.6330 did not support HTTPS pointers at all. You added them manually i think. 2.0 – you should install .net framework 4.6.1. I always addes Let’s Encrypt by using the panel. When I added it, the Require Server Name box was always checked. Now when a certificate is renewed or added, the box is not checked and all other websites give an arror because of the invalid certificate. If 2.0 did you set SNI checkbox in SSL Settings in IIS Provider settings in Panel? I’m using 1.0. It always worked. So something was changed or is buggy. Never had to do this manually. Should be fixed in latest.